The Duomo in Florence Italy is actually called Basilica di Santa Maria del Fiore, the complete building is referred to as Duomo, not only the dome on top, which is called the Cupola. This is a confusing fact, because the word Duomo really sounds a lot like it represents the dome, which it does not. 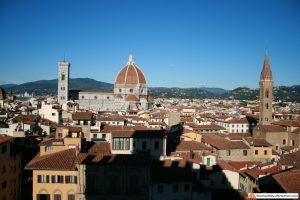 When you refer to the dome on top of the Basilica di Santa Maria del Fiore you speak of the Cupola, when you speak of the cathedral itself refer to Florence Duomo, or Basilica di Santa Maria del Fiore if you want to show off. 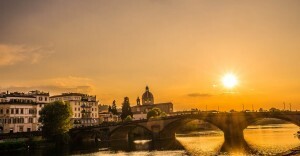 In Florence, we also use the word Duomo to define the complex of monuments including the Cathedral, the Crypt, the Bell Tower, the Dome, the Baptistery and the Opera del Duomo Museum. The Cathedral has quite an interesting history. The order for the design of the Duomo was given at the end of the 13th century and the Duomo had to replace the smaller Santa Reparata. The Duomo would be devoted to Maria yet the name that was chosen, Santa Maria del Fiore, also referred to the name of the city we now call Florence which was Fiorenza at that time. Florence was the center of the world and this new cathedral had to represent that dominance in the world and overshadow the cathedrals of Siena and Pisa. Arnolfo di Cambio made the drawings for the Duomo and the build started in 1296 to end abruptly in 1310 when Arnolfo di Cambio died. In 1334 Giotto di Bondone was appointed construction master and construction continued. Giotto added the campanile to the project, this campanile is now referred to as the Giotto’s Bell tower. Giotto died in 1337 and Andrea Pisano took over the project, which was halted again on 1348 due to the plague that spread through Europe at that time. 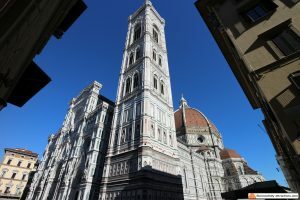 In 1349 construction of the Duomo continued again with Architect Francesco Talenti who completed the Bell Tower; then, in 1364, a commission approved a revision of the project, deciding to make the church even larger. All the walls and the roof were completed by 1421, but there was a problem: the Cupola had to be built but the architects had no idea how to support the enormously heavy dome. The Opera del Duomo, the institution responsible for building the Cathedral, was well aware of this problem and some years earlier, in 1418, started to listen to architects to find a solution. One of the ideas was to fill the cathedral with dirt (to sustain the dome under construction) and put gold coins inside the dirt to encourage the people of Florence to digg out the dirt after construction had finished. This fascinating idea was never carried out and the Opera del Duomo organized a competition in which architects could send in their ideas and have a chance to win and be appointed master builder of the Duomo. Filippo Brunelleschi had an idea but refused to share it and even coded his calculations so that the competition could not run off with his ideas. The commission didn’t accept this at first but had to in the end because no other really great ideas were send in. 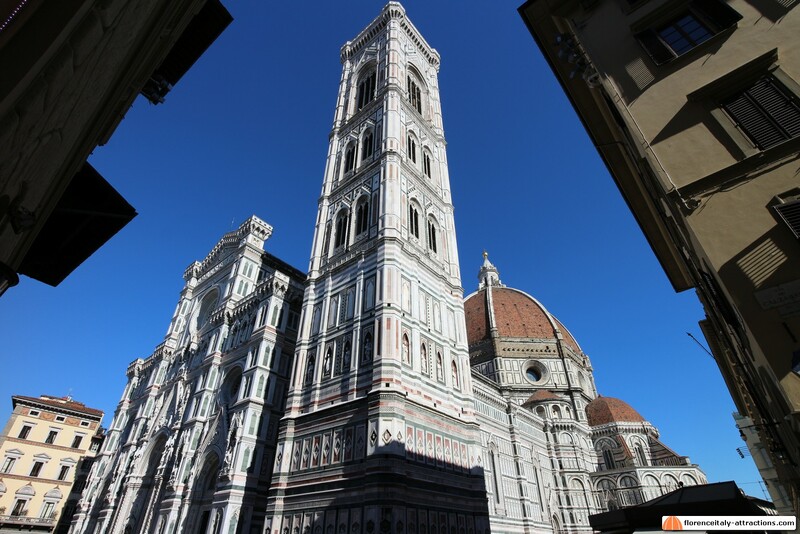 Filippo Brunelleschi started working on the Cupola on April 14th 1420 with his ambitious double shell idea and finally in 1436 the Duomo was finished after 140 years of construction. Pope Eugenius IV initiated cathedral. Brunelleschi’s dome is considered the greatest achievement of architecture during the Renaissance.